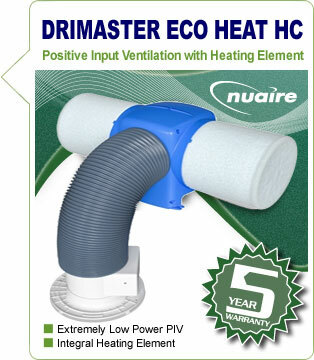 The Drimaster ECO HEAT HC is the top-of-the-line unit from the UK's leading PIV manufacturer. This low cost 'whole house' ventilation solution helps to save energy, remove dust, mould, odours and prevent condensation build-up. The ECO HEAT unit also includes a small heater to lift the temperature of the supply air in Winter. Without it the supply air will be the same temperature as your loft. The HC stands for Hallway Control, which means you can adjust the settings from a small control panel built into the air diffuser on your landing, without having to climb into the loft. The HC is also compatible with optional CO2 and humidity sensors that automatically increase the fan speed when needed. Firstly, it means that a significant proportion of external pollutants are prevented from entering the home. Secondly, the use of the otherwise unused heat in the roof results in the ventilation unit providing a significant net energy gain to the home. Thirdly, there is no better way to ventilate a home than from the inside out via a single, centrally located, supply air diffuser. Positive input ventilation have been clinically proven to help allergy and asthma sufferers by effectively removing high quantities of dust and particules from the air within your home. PIV units also help reduce and maintain radon gas levels. Twin sensors optimise energy efficiency, adjusting settings to provide increased comfort. All Nuaire PIV units are compliant under Part F & L of the 2010 Building Regulations. Solarcrest provide a nationwide supply, installation and commissioning service with BPEC certified installers. We also provide commissioning only, required under 2010 regs, if you prefer to install the system yourself. In which case we can provide installation guidance by telephone and email. Unlike many PIV units the air filters in the Nuaire PIV range only require an annual inspection and clean, normally with a vacuum cleaner. More frequent inspection post-building work is prudent as the filters are likely to pick up more dust than normal. All filters are generally very easy to access and can be upgraded to F5 pollen filters if you suffer from hay fever. Other than the filter inspection the PIV is a fit and forget item. All Nuaire units come with a 5 year warranty for added peace of mind.